Web visitors act with some activity prior to cart abandonment like placing the pointer in the URL. 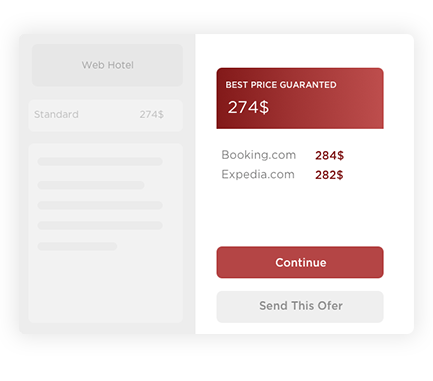 A promotional message together with Price Comparison information pops-up and most visitors go back to close the purchase. Web visitors abandon the hotel website. Before leaving, we suggest that they leave us their email address. We send the current offer to their email inbox in order to continue the purchase later. Great for multi-device purchasing processes, like when you look for information on your mobile whilst commuting but you close the process later at home.